Summer is coming, and coffee drinkers are likely to be searching for a caffeine-rich alternative to the hot beverage. If you’re like me, the taste of coffee is perfect and doesn’t need to be changed, however, simply icing down (watering down) your hot coffee isn’t the way to remedy the beverage for the hot months. Created to extract coffee beans in a unique way. 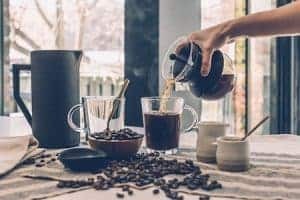 In cold brew beans never come into contact with heat, the coffee oils don’t develop the same acidity and characteristically bitter tang as you might find in your traditional cup. As a result, you get a richer, smoother, cup of coffee that refreshes and caffienates. Now there’s an opinion we can agree on! The best method for making cold brew coffee is easy to do in your own home. Let’s take a look at some of the best cold brew coffee makers on the market today. Okay, we fully admit that this brewer has the footprint of a space station, it’s large, but it brews some mighty fine cold-brew concentrate and enough for many to enjoy throughout the day. This isn’t just brewing in a mason jar, the OXO “Rainmaker” water dispersion technology keeps the extraction even while also allowing the user to set up the brew and leave it. Since convenience is a large facet of cold-brew iced coffee one will find that the OXO Good Grips cold brewer is particularly useful. 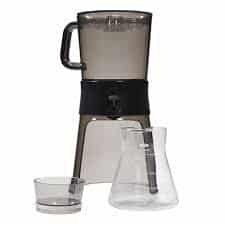 The construction of the glass carafe into which the concentrate is brewed feels more fragile than some of the other brewers on the market, but it’s clearly functional and comes in at a great product point. If you’re worried about imparting chemicals from paper into your coffee then it’s functional without them. While paper filters are known to filter out oils and contribute clarity to the finished brew, there’s actually a built-in metal mesh filter giving the user the added benefit of an eco-friendly element. Dispension is easy, and there’s even a measuring cup to help you properly dilute the concentrate. You might be looking at this and wondering what the big deal is. It’s a mason jar and a filter. We understand the concern, but wait! 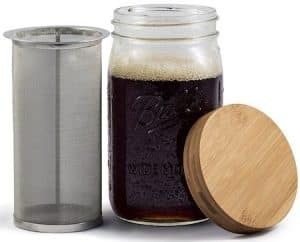 There’s definitely an added benefit to this Simple Cycle Mason Jar Cold brewing system if you want to enjoy a cold brew while camping. 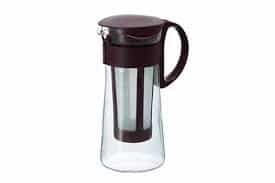 It’s easy to replace the ‘carafe’ itself if it gets broken and the filter itself is sturdy enough to warrant a buy. This cold-brew kit easily adapts to fit into quart and half-gallon size canning jars, this is also convenient if you’re prepping for more than one brew at a time. Simply brew for each jar and seal. And if you are camping, the jar, filter, and coffee can all be stored as one solid unit for compact convenience. The bamboo lid gives an aesthetically pleasing addition to the design as well, so you’re not just packing around a mason jar and a filter. It’s also a great way to gift fresh cold brew to your fellow coffee f(r)iends. Cold-brew coffee is already a quick and easy way to get caffeinated in the morning, but if you’re familiar with the work of the Hario company you already know that quality engineering is going to play a major role in this device. Coffee grounds go into the reusable mesh basket–for an eco-friendly touch—and is submerged in cool or room-temperature water. Simply let time do the rest! While metal mesh can be somewhat tricky to scrub completely clean, it still beats the soaking and rinsing of cloth filters, and it is much more eco-friendly than paper. Hario is a trustworthy brand that really knows their coffee making gear, offering the likes of grinders, brewers, and storage containers. The Hario Mizudashi cold brew pot is no exception. This contraption works as simply as soaking your grounds within the container and letting it sit overnight. Its elegant design is one to show off when entertaining guests! Another travel-light option for those fully versed in cold brew education. Takeya loves their fresh cold brew coffee makers and this 1-quart brewer is no exception. Portable enough to go anywhere you can go. It makes 4 servings of coffee and has an airtight, leakproof lid, so you can take it along without worry about spilling. Let’s say you’re staying at a hotel, simply load this thing with coffee the night before, and let sit in the refrigerator, typically will fit in most refrigerator doors. You’ll awaken to cold brew that’s potent and tasty. 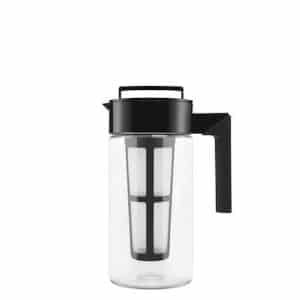 Since the Takeya cold brew coffee maker is a larger container, it doesn’t really double as a to-go mug, but it’s ideal for sharing your cold brew batch. If you’re trying to enjoy cold brew but aren’t working on practicing patience, you’ll be surprised to hear about the world’s first Rapid Cold Brew System. This is called ColdBoil technology, and it makes a delicious cold brew in just under 5 minutes. The simplified process eliminates any waiting period for a cup of fresh cold brew. This is essentially seven servings of cold brew just as fast as your drip brewer. 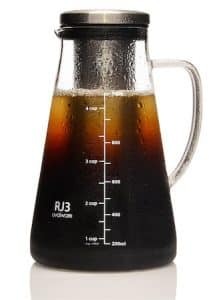 The Dash Rapid Cold Brew System can also make cold brew concentrate. Traditionally, cold brew is coffee that has been steeped for a long period of time in cold water. The thing that makes cold brew taste so different is that the coffee beans never come in contact with heat, thus there isn’t the reaction of coffee oils in contact with boiling water. That makes for a brew that isn’t acidic or bitter in the wrong way. Cold brewing is a process that usually takes eight hours or more, but this brewer has uses a rapid cold brew system that pumps cold water through the grounds. The result is a richer cup of joe with a smoother finish that’s easy on your stomach. It’s also constructed of dishwasher-safe materials. There’s nothing about this appliance that doesn’t speak the language of convenience. 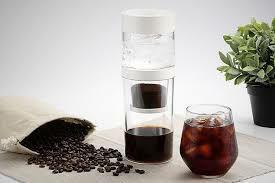 If you’re a one and done coffee drinker, you could definitely benefit from the Ovalware Airtight Cold Brew Iced Coffee Maker and Tea Infuser, which also functions perfectly for storing your homemade cold brew for several days. It’s constructed of great materials and made to last. The Ovalware Airtight Cold Brew Iced Coffee Maker holds four cups of coffee, and with an airtight seal, it will keep your cold brew fresh. This is ideal if you don’t want to make a new batch of cold brew during the week. The product’s steel filter is made of superfine mesh, and both pieces are dishwasher safe for easy cleanup. This is a sleek design and the look of the glass carafe and that the brewer is ergonomically designed to fit comfortably in the fridge. And it looks like a science experiment, which is always a plus when entertaining guests. Entertaining large groups, and looking for something a bit creative and out of the box? Let’s try serving some cold brew for your next party! 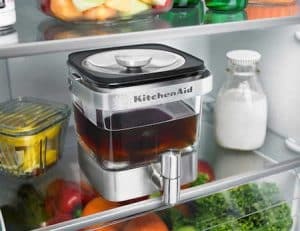 With the KitchenAid Cold Brew Coffee Maker, which can hold up to 14 servings of coffee and has a convenient tap for pouring, you’re going to find the cold brew to be a staple of your gatherings. This sleek cold brew maker is made of stainless steel and glass for great looking design as well. It’ll go great with anything on your countertop. Simply add coffee and water into the machine, then place the whole thing in the fridge to steep. There’s even a built-in tap to dispense the right amount of coffee into your cup. While this brewer may be on the higher end of the spectrum it’s arguably worth the price if you drink a lot of cold brew coffee or frequently host parties. Perhaps the most compact of the brewers on this list, the small and light DRIPO Cold Brew Portable Barista is perfect for those mornings when you just need a quick pick-me-up before heading off to work or school. You can even take it with you for coffee beverages on the go! The secret of the DRIPO lies in its brewing system which originated with the Japanese and Dutch. Instead of creating a coffee concentrate that must be chilled by an external source, this unit drips cold water directly over your grounds. Within 2-3 hours the result is prepared fresh, cool and drinkable. Although this is a rudimentary and simple design, it’s added benefit is that it’s great for traveling, and camping, and offers a back-to-basics approach to the cold brew experience. Meditational if you will! The brewer itself weighs just 1.2 pounds. 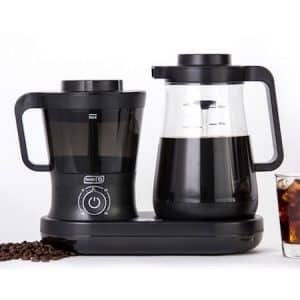 If any of these cold brewers have got you excited about this style of coffee making, it’s certainly recommended that you give the drink another try. This style of beverage is taking the world by storm and we fully understand why. It’s a potent, easy to drink, and great tasting form of coffee. So why not save the extra money and invest in a home brewing system. As always, make sure to check out the rest of our coffee maker reviews and peruse the gear we have to offer as well. Good luck on your further coffee making voyages.